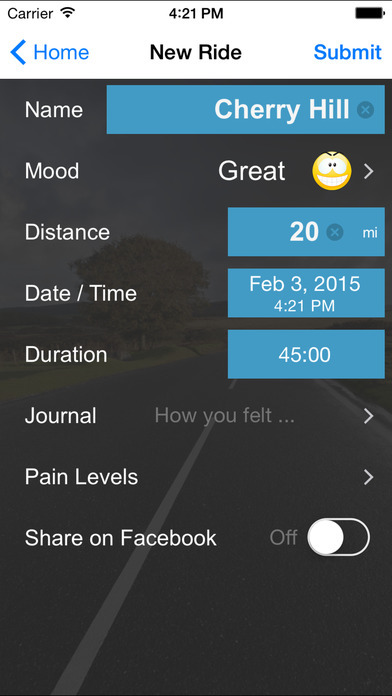 Use this app to keep track of your workouts and how you felt. Each time you submit a new workout, it gets added to your total distance to date and averages your pace per week, month, and overall. This allows you to track your overall progress in an easy to use and light weight tool. Record your distances and time, Runner's Journal will automatically calculate your total distances and paces on a weekly, monthly, and overall basis. Keep track of your workouts by rating how you felt and record specifically how you felt or why you felt a certain way while running. The app was designed to work with your iPhone 4s thru iPhone 6, iPad, iPad 2, and iPod Touch allowing all users the benefit of easily tracking your workouts. Share your workout with your friends on Facebook. Compete with your friends to see who can run further this week or next month.